This guy is carrying me through arena. Moroes gives me an army of stewards to ram into minions and then i drop this guy. 9/10 arena. The funny part? Would actually be better if it got 'nerfed' to a 6/8. Think of it like a reverse Grim Patron. If you increase a Patron's attack, it becomes useless, while deceasing Lumberer's attack makes it so much better because it won't become a BGH target. Funny how Hearthstone balance works. If this will be bgh'ed i will be happy - it means my Boom, Rag, Nefarian or whatever else is in safety. Was innvervate involved? I don't see how he could play all these (poison seed 4mana + starfall 5mana) in one turn unless with innvervate. Or maybe he killed at least 2 of his own minions? On my turn 9 I had two minions on board and then I stupidly played Dr. Boom which puts a total of 5 minions on board. 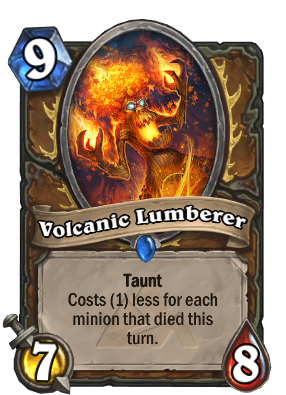 Then on his turn 9 play he does poisons seeds which kills 5 minions, starfall kills another 5 minions, so a total of 10 minions died which makes the two volcanic lumberers cost 0.
oh I forgot about poisoned seed kills minions, I thought it was transformation. This card saved me in the Druid class challenge. The problem is, in constructed, opponents doesn't like to leave minions on your side of the field in fear of the FoN + Savage Roar combo. So you rarely get to trade minions enough to cast Volcanic Lumberer for cheap. Dark Wispers is 6 mana, and these don't really 'cost 0' if you have to use a 10-mana combo to make them that way. Why don't you just play a Sea Giant? Or two? You don't need to kill minions or have a combo to play the Sea Giants. They cost 5 mana each if you play Dark Wispers minus 1 mana for every minion that was already on the board (either on your or on the opponent's side). So if there were 4 enemy minions (as the example states above), you can play 2 Sea Giants with a Dark Wispers on turn 8. And this is guaranteed, no need to play the - never used - Poison Seeds. Fatigue decks run this kind of removal but i dont think this card is that good for them because of BGH lurking in most decks atm. maybe new deck with board removals ?